A landmark study from Finland suggests that having an extreme daily nurse workload increases the risk of patient safety incidents and deaths. The study – published in BMJ Open – found the chances of a patient safety incident increased to about 30% if nurses’ workload went above “optimum” levels and the probabilities of a patient dying increased by about 40%. Meanwhile, researchers found that when workload dropped and nurses had more time to observe and care for patients the risk of safety incidents and deaths was about 25% lower. The study is based on data from 36 units in four Finnish hospitals with information about nursing workload, staffing, patient safety incidents and mortality rates collected daily over one year. The researchers, from Åbo Akademi University, were able to obtain detailed information about nursing workload thanks to the RAFAELA patient classification system, which was developed in Finland in the 1990s to ensure safe staffing levels. Instead of using fixed nurse-to-patient ratios, it uses daily data on patient’s care needs and the workload per nurse to ensure an appropriate number of staff on the wards. When nursing workload went above the “optimal” level, the risk of a patient safety incident increased by 8% to 32%, depending on the type of incident. Meanwhile, the risk of patient mortality increased by 43% if workload exceeded the preferred level.However, if workload was below that level, the risks of a safety incident or death reduced by roughly a quarter or between15% to 27%, depending on the type of incident. A reduced workload “would mean that nurses have more time for caring and observing each patient, which may reduce the risk for adverse events and accordingly prevent the patient’s health condition from deteriorating”, said the study authors, led by Professor Lisbeth Fagerström. “We found evidence that a staffing measure based on daily measurements of individual patient care needs and the recommended nursing workload is slightly better in predicting incidents and mortality rates, as compared to the standard patient-to-nurse ratio,” said the paper. They also make it clear that their calculations do not take account of the potential influence of skill mix, nurses’ level of competence or experience and the exact amount of time nurses were able to spend working directly with patients. Peter Griffiths, Chair of health services research at the University of Southampton, said the headline findings were not surprising.Professor Griffiths said some aspects were “striking” including the fact patient outcomes continued to improve when workload dropped below what was perceived to be “optimal” levels. 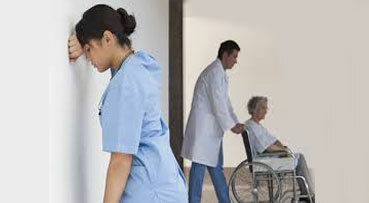 “Basically, the results are not new – higher nursing workload is associated with worse outcomes. We’ve seen that in lots of studies,” he told Nursing Times“However, a lot of previous research can be criticised, because it just uses a patient count as a measure of workload, although results are typically adjusted for patient acuity,” he said. Professor Griffiths said the findings backed up previous research on the link between staffing and patient outcomes and actually showed criticism of past studies was “invalid”. “Here we see the results of the system correlating with outcomes which lends it some support, although it is striking that as staffing levels rise above what the system sees as ‘optimum’, outcomes continue to improve,” he said. “It is also striking that this happens in Finland, a country where the RN4CAST study found that registered nurse staffing levels were similar to the UK,” he added, highlighting a major piece of European research on nursing and safety.